By following honeyguides, a species of bird, people in Africa are able to locate bees’ nests to harvest honey. Research now reveals that humans use special calls to solicit the help of honeyguides and that honeyguides actively recruit appropriate human partners. This relationship is a rare example of cooperation between humans and free-living animals. What’s remarkable about the honeyguide-human relationship is that it involves free-living wild animals whose interactions with humans have probably evolved through natural selection, probably over the course of hundreds of thousands of years. Humans have trained a range of species to help them find food: examples are dogs, falcons and cormorants. These animals are domesticated or taught to cooperate by their owners. Human-animal collaboration in the wild is much rarer. But it has long been known that, in many parts of Africa, people and a species of wax-eating bird called the greater honeyguide work together to find wild bees’ nests which provide a valuable resource to them both. Honeyguides give a special call to attract people’s attention, then fly from tree to tree to indicate the direction of a bees’ nest. 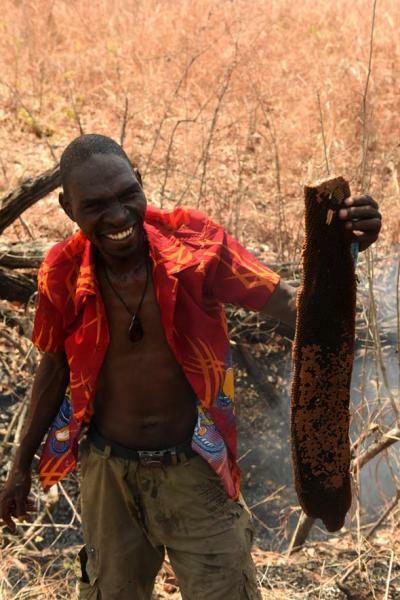 We humans are useful collaborators to honeyguides because of our ability to subdue stinging bees with smoke and chop open their nest, providing wax for the honeyguide and honey for ourselves. Experiments carried out in the Mozambican bush now show that this unique human-animal relationship has an extra dimension: not only do honeyguides use calls to solicit human partners, but humans use specialised calls to recruit birds’ assistance. Research in the Niassa National Reserve reveals that by using specialised calls to communicate and cooperate with each other, people and wild birds can significantly increase their chances of locating vital sources of calorie-laden food. This reciprocal relationship plays out in the wild and occurs without any conventional kind of ‘training’ or coercion. “What’s remarkable about the honeyguide-human relationship is that it involves free-living wild animals whose interactions with humans have probably evolved through natural selection, probably over the course of hundreds of thousands of years,” says Spottiswoode, a specialist in bird behavioural ecology in Africa. 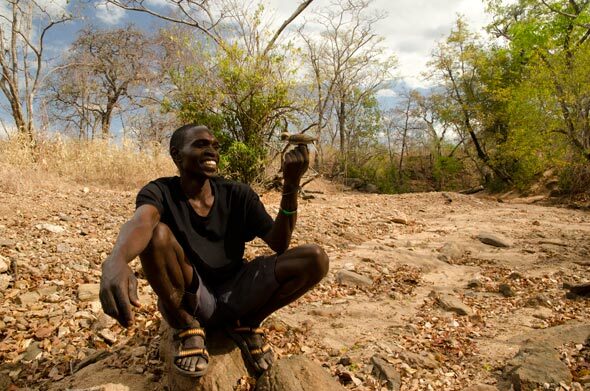 With the help of honey-hunters from the local Yao community, Spottiswoode carried out controlled experiments in Mozambique’s Niassa National Reserve to test whether the birds were able to distinguish the call from other human sounds, and so to respond to it appropriately. The ‘honey-hunting call’ made by honey-hunters, and passed from generation to generation, is a loud trill followed by a short grunt: ‘brrr-hm’. To discover whether honeyguides associate ‘brrr-hm’ with a specific meaning , Spottiswoode made recordings of this call and two kinds of ‘control’ sounds : arbitrary words called out by the honey-hunters and the calls of another bird species. When these sounds were played back in the wild during experimental honey-hunting trips, birds were much more likely respond to the ‘brrr-hm’ call made to attract them than they were to either of the other sounds. “The traditional ‘brrr-hm’ call increased the probability of being guided by a honeyguide from 33% to 66%, and the overall probability of being shown a bees’ nest from 16% to 54% compared to the control sounds. In other words, the ‘brrr-hm’ call more than tripled the chances of a successful interaction, yielding honey for the humans and wax for the bird,” says Spottiswoode. 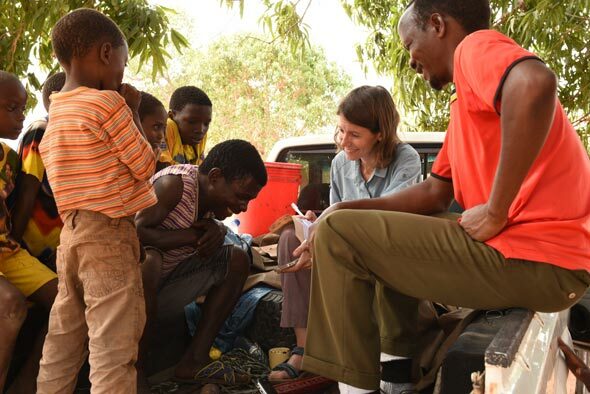 Human cooperation is crucial to honeyguides because bees’ nests are often hidden in inaccessible crevices high up in trees – and honeybees sting ferociously. 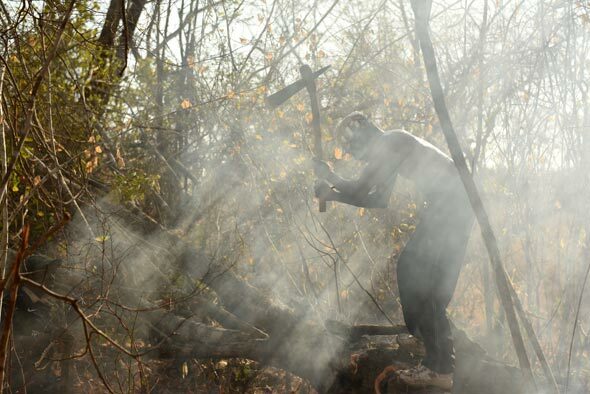 Therefore the honeyguide waits while an expert human undertakes the dangerous tasks of subduing the bees (by smoking them out using a flaming bundle of twigs and leaves hoisted high into the tree) and extracting the honey from within, usually by felling the entire tree. 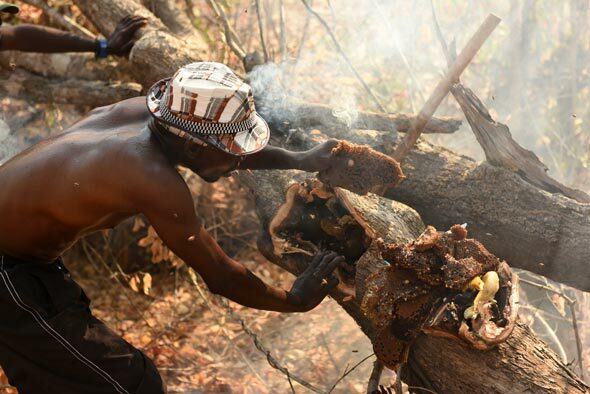 There is no competition for the prize: the honey-hunters harvest the honey and honeyguides devour the wax combs left behind. This foraging partnership was recorded in print as early as 1588, when a Portuguese missionary in what is now Mozambique observed a small brown bird slipping into his church to nibble his wax candles. He described how this bird had another remarkable habit: it led men to bees’ nests by calling and flying from tree to tree. Once the nest was located, he wrote in his account of life on the eastern African coast in the 17th century, Ethiopia Oriental, the men harvested the honey and the bird fed on the wax. “What João dos Santos described was what we now call a mutualism between species. Mutualisms are crucial everywhere in nature, but to our knowledge, the only comparable foraging partnership between wild animals and our own species involves free-living dolphins who chase schools of mullet into fishermen’s nets and in so doing manage to catch more for themselves. It would be fascinating to know whether dolphins respond to special calls made by fishermen, as Pliny the Elder asserted nearly two thousand years ago,” says Spottiswoode. Inset images: Yao honey-hunter Orlando Yassene harvests honeycombs from a wild bees’ nest in the Niassa National Reserve, Mozambique (Claire Spottiswoode); Yao honey-hunter Orlando Yassene holds a female greater honeyguide temporarily captured for research in the Niassa National Reserve, Mozambique (Claire Spottiswoode); Yao honey-hunter Orlando Yassene chops open a bees’ nest in a felled tree in the Niassa National Reserve, Mozambique (Claire Spottiswoode); Yao honey-hunter Orlando Yassene holds a wax comb (honeyguide food) from a wild bees’ nest harvested in the Niassa National Reserve, Mozambique (Claire Spottiswoode); Claire Spottiswoode interviewing honey-hunter Issufo "Kambunga" Jaime (Mbumba Marufo). Yao honey-hunter Orlando Yassene holds a male greater honeyguide temporarily captured for research in the Niassa National Reserve, Mozambique.